A simple no cook sauce perfect for tossing with veggies, pasta or spooning over grilled meat. Place the herbs in a food processor. Pour in 1 tablespoon of the oil and blend into a paste. Gradually add the remaining ingredients in order scraping as needed. Blend until smooth. 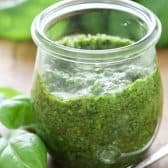 Any leftover pesto can be either refrigerated for a few days. Or alternatively you can freeze in small portions for future use.